The olives you eat come from a tree that is, on average, anywhere between 10 and 50 years old. The olives you eat come from a tree that is, on average, anywhere between 10 and 50 years old. Of the estimated 300 million olive trees on the 2.4 million of hectares that Spain dedicates to this valuable crop (respectively 1.4 million and 700,000 in the 2 other Olive Super Powers, Italy and Greece) there is many an older tree. 'More than 1000 years old' is a bit of an exaggeration though: according to scientists the oldest tree in Spain, in the Catalan region of Montsià is 630 years old. 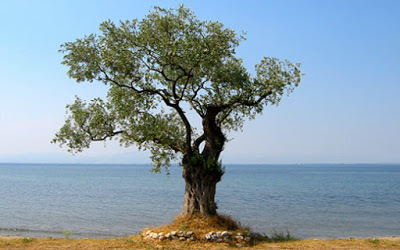 And such trees still produce olives, be it far less than their younger cousins for they are frail and can't be shaken. 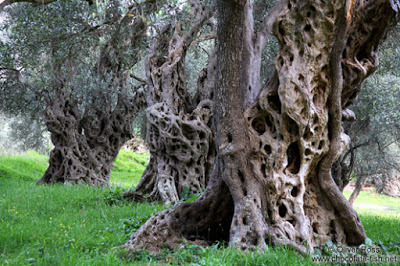 No one can be sure that the variety of olive trees in Spain are direct descendants of the ones that grew in ancient Greece or Rome, but it is supposed they are at least similar - and the fact that these historical trees are still cultivated provides locals with a strong sense of connection to history. The olive cultivation and oil extraction was brought by the Phoenicians to Iberia around 1050 BCE, and once again by the old Greeks between 600-700 BCE. But it were the Romans who turned Iberian oil into a veritable industry. The importance of Iberian oil to the Roman Empire was huge. Amphorae have been found in all Roman provinces, though most of the production was destined to Rome itself - that largest of all large cities, with at one point even more than 1 million inhabitants (no city on earth would have that many again until the 19th century). It was a very important trade. The Emperor Hadrian even had a coin struck bearing the picture of an olive branch and the inscription 'Hispania'. Then again, his forefathers came from Seville and he must have had a soft spot for anything coming from that rough and dry peninsula. The fall of the Roman Empire led to the decline of olive production in the rest of Europe. Southern Spain though saw an increase in cultivation with the arrival of 'the Moors' (90% Amazigh, 10% Arabs) who brought with them new varieties and production techniques. This is the reason why most countries use the word 'olive' - from the Latin oleum - whereas the Spanish speak of 'aceituna' and 'aceite' - from the Arabic al-zait, which means olive juice. With the rise of the Catholic fundamentalism after the reconquista, pork came to be seen as a sure sign of faith. 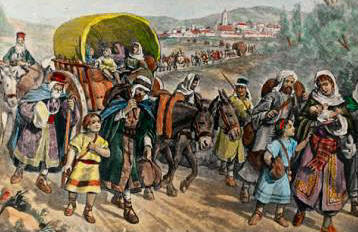 And so was the dominant use of lard (manteca) fatal for the reputation of olive oil, which began to be associated with plebes and people with suspicious blood lineages: Moriscos and Jews. The latter were either forced to convert or were expelled or left - and with them the standing of olives and olive oil. "Spanish cooking overflows with garlic and religious prejudices" Julio Cambra, Galician writer (born 1884). It wasn't until the late 19th century that Spanish cookery writers began to extol the virtues of olive oil over lard again. And very slowly it started to lose its backward image of rural poverty. By the late 1970s production had begun to fully recover, thanks to the mounting medical evidence of its benefits, and the rising cultural pride in such a talisman of the Mediterranean. Today, Spanish olive oil enjoys a world wide reputation for quality. Sometimes in surprising ways: to this day Spain exports millions of tons of olive oil to Italy, where a label in Italian is stuck on a beautiful bottle, which is then re-exported to Northern Europe for twice the price.